I can do outfits. I can clean and organize like nobody’s business. But decorating? It’s frustecorating. I stink at it. My process involves buying things and taking them back. Buying things and taking them back. I have three places in my house that need some sprucing. The wall space above my television, a wall beside the front window, and the space above my computer. I utterly failed at the first two. I consider this a minor success. I found the mirror on clearance at Target. The two small pictures with typewriter keys on them came from HomeGoods. It’s trendy geek. Perfect. The other six pictures I purchased I will be returning. Bleh. But you’re probably not here for my lame decorating tips. I will spare you another ode to the Nutribullet. But seriously, you should get one. Here’s another fantastic oatmeal remix made creamier and smoother than ever with the magic of the Nutribullet. Boil the 1/2 cup of water and the 1/2 cup of almond milk. Reduce the heat to medium and add 1/2 cup of oats. Cook for 5 minutes. In a blender or bullet, add half of the cooked oats, 1/2 of the banana, 1 tablespoon of greek yogurt, 1 tablespoon of chia seeds, 1/2 scoop of vanilla protein powder, 1 1/2 tablespoons of cinnamon, 1 tablespoon of vanilla flavor, and a dash of nutmeg. Combine until smooth. Put about half of the mixture in a bowl. Slice the remaining 1/2 banana and add a layer of banana slices. Add the remaining oats that you didn’t blend. Add the rest of the blended mixture. 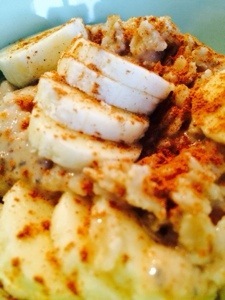 Layer the remaining banana on top and splash with some cinnamon. So pretty.